Lightning striking a power line. Notice it DID NOT strike the towers though they are taller than the position where lightning struck. Lightning is the MOST UNDERRATED weather hazard. On average, only floods kill more people. Lightning makes every single thunderstorm a potential killer, whether the storm produces one single bolt or ten thousand bolts. In the United States, lightning routinely kills more people each year than tornadoes or hurricanes. Tornadoes, hail, and wind gusts get the most attention, but only lightning can strike outside the storm itself. Lightning is the first thunderstorm hazard to arrive and the last to leave. Lightning is one of the most capricious and unpredictable characteristics of a thunderstorm. Because of this, no one can guarantee an individual or group absolute protection from lightning. However, knowing and following proven lightning safety guidelines can greatly reduce the risk of injury or death. Remember, YOU are ultimately responsible for your personal safety, and should take appropriate action when threatened by lightning. The safest location during a thunderstorm is inside a large enclosed structure with plumbing and electrical wiring. These include shopping centers, schools, office buildings, and private residences. If lightning strikes the building, the plumbing and wiring will conduct the electricity more efficiently than a human body. If no buildings are available, then an enclosed metal vehicle such as an automobile, van, or school bus makes a decent alternative. Not all types of buildings or vehicles are safe during thunderstorms. Buildings which are NOT SAFE (even if they are "grounded") have exposed openings. These include beach shacks, metal sheds, picnic shelters/pavilions, carports, and baseball dugouts. Porches are dangerous as well. Convertible vehicles offer no safety from lightning, even if the top is "up". Other vehicles which are NOT SAFE during lightning storms are those which have open cabs, such as golf carts, tractors, and construction equipment. Once inside a sturdy building, stay away from electrical appliances and plumbing fixtures. As an added safety measure, stay in an interior room. If you are inside a vehicle, roll the windows up, and avoid contact with any conducting paths leading to the outside of the vehicle (e.g. radios, CB's, ignition, etc.). 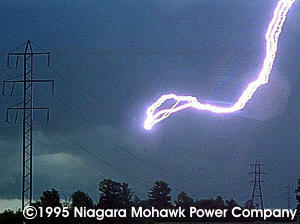 Lightning can travel great distances through power lines, especially in rural areas. Do not use electrical appliances, ESPECIALLY corded telephones unless it is an emergency (cordless and cell phones are safe to use). Computers are also dangerous as they usually are connected to both phone and electrical cords. Do not take a shower or bath or use a hot tub. A lightning safety plan should be an integral part of the planning process for any outdoor event. Do not wait for storm clouds to develop before considering what to do should lightning threaten! An effective plan begins LONG before any lightning threat is realized. You can't control the weather, so you have to work around it! Detailed weather forecasts are accurate only out to seven days at best, but outdoor events often are planned many months in advance. Because of this limitation, every outdoor event coordinator should consider the possibility of lightning, especially if the event is scheduled during the late spring to early autumn months. Where is the safest lightning shelter? How far am I (or the group I am responsible for) from that location? How long will it take me (or my group) to get there? Knowing the answers to these questions will greatly reduce your chances of being struck by lightning, provided you know them BEFORE thunderstorms threaten! Studies have shown most people struck by lightning are struck not at the height of a thunderstorm, but before and after the storm has peaked. Most are unaware of how far lightning can strike from its parent thunderstorm. Lightning can strike be more than 10 miles away from location of rainfall. Therefore, if you can hear thunder, that IS YOUR WARNING that you are within striking distance. Seek safe shelter immediately. Remember this lightning safety rule...When thunder roars, go indoors and stay there until 30 minutes after the last clap of thunder. DO NOT wait for the rain to start before seeking shelter, and do not leave shelter just because the rain has ended. With common sense, you can greatly increase your safety and the safety of those around you. At the first clap of thunder, go to a large building or fully enclosed vehicle and wait 30 minutes after the last clap of thunder before you go back outside. Plan Ahead! Make sure you get the latest weather forecast at weather.gov before going out. 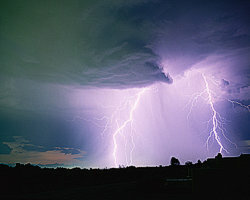 It is your behavior when thunderstorms are in the area that determines your personal risk of being struck by lightning. The best way for you to protect yourself from lightning is to avoid the threat. You simply don't want to be caught outside in a storm. Carry a NOAA weather radio (found at most electronics stores) or a portable AM radio with you, especially if you will be away from sturdy shelter (such as while boating, camping, etc.). This way you will always be able to get the latest forecast. As lightning occurs, it creates static on the AM radio band. The loudness of the static is directly related to the proximity of the thunderstorm. So if you begin to hear static, keep an eye to the sky as a thunderstorm may be approaching. To minimize your personal risk of being struck by lightning, when going outside, plan ahead so that you can get to a safe place quickly if a thunderstorm threatens. If the sky looks threatening or if you hear thunder, get inside a safe place immediately. Once inside, avoid contact with corded phones, electrical equipment, plumbing, and windows and doors. Finally, wait 30 minutes after the last lightning or thunder before going back outside. Plan Ahead! Make sure you and someone else in the group gets the weather forecast before going out and make your lightning safety action plan known by all members in the group. Designate one of the members to monitor NOAA weather radio or a portable radio. This way you will always be able to get the latest forecast. If you have a wireless device that is internet capable, you can also obtain that information. If your wireless device can also display graphics, you can also view the local NWS Doppler radar to determine location of thunderstorms. If thunderstorms are expected and you go ahead with your planned outdoor activity, have a lightning safety plan in place. Upon arriving on-site, determine how far away your shelter is in case lightning threatens. Remember to account for the time it will require to get to your safe location. If you hear thunder, even a distant rumble, immediately move all to a safe place. Do not wait. You are in danger of being struck by lightning. Do not resume outdoor activities until 30 minutes after the last thunder clap. Plan Ahead! Make sure the event organizers responsible for safety get a good weather forecast before the event begins and make your lightning safety action plan known and used by all event organizers. Safety organizers should monitor NOAA weather radio (found at most electronics stores), a portable radio, or local cable, radio or TV broadcasts. Since it may take considerable time to evacuate people to a safe location, personal observation of the lightning threat may not be adequate, especially for fast moving lightning storms. Hand held or portable lightning detectors should be made available so that lightning can be observed significant distances from the event site. Event organizers should know how long it will take to get people to safe shelter. With large groups of people, safe locations must be identified beforehand, along with a means to route people to these locations. Event organizers might consider placing lightning safety tips on programs, score cards, etc. Lightning safety placards set up in strategic locations can be an effective means of raising awareness and communicating the lightning threat to the attending audience. 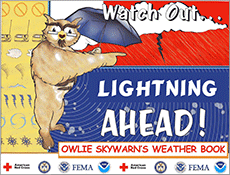 Learn more at the National Weather Service Lightning Safety website. Immediately move to safe shelter: a substantial building with electricity or plumbing or an enclosed, metal-topped vehicle with windows up. Stay in safe shelter at least 30 minutes after the last sound of thunder. Stay off corded phones, computers and other electrical equipment. Benjamin Franklin's kite was NEVER struck by lightning! Lightning does not always strike the tallest object, only the tallest object in a particular area. Lightning can strike ANY object in its path, not just metal. Just because it's not raining doesn't mean you cannot be struck by lightning...if you hear thunder, take shelter. In fact, most people struck by lightning each year are in rain free areas miles away from a thunderstorm. Rubber soles of shoes (or rubber tires) are not insulators from lightning. They offer zero lightning protection. If you see lightning, count the number of seconds until you hear thunder. Divide the number of seconds by five (three, in the metric system) to get the distance, in miles (in kilometers), to the lightning strike or bolt. For example, if you see lightning and it takes 15 seconds before you hear the thunder, then the lightning is 3 miles (5 kilometers) away from you (15 divided by 5 = 3 miles).